I had big plans to make my first-ever trip to the East Coast this Spring. My friend Wix has been in Rhode Island building toys for Milton Bradley or something and he invited me to come out to visit. Traci’s stint on bedrest, combined with the gov’t extorting a huge amount of taxes from us, however, voided the plans. In consolation, friend Tyler offered to let me use some of his frequent flyer miles to visit him in sunny Las Vegas and enjoy a rock ‘n roll weekend. We were able to see Strung Out, Bad Religion and Streetlight Manifesto during my 48 hour trip. At the House of Blues, I was standing on the floor, right against the wall that separates the floor from the bar above. Everyone put their half-empty beer cups against the wall (you know, so they could grab 'em later). Any time the crowded pushed back, I stepped on another drink. My shoes were soaked by the end of the show. At the Extreme Thing festival, the teens were getting restless waiting for Streetlight to come on. Empty water bottles started sailing through the air--no biggie. But water bottles led to empty cans of Red Bull which led to not empty cups of Slushies, which led to flying CDs and shoes. I left feeling very sticky. Ty asked me to bring my tennis racquet on the trip. I play tennis once a year with Traci's dad, so I'm really good. Ty didn't know where the closest tennis courts were, so he looked some up on the internet. Our first try yielded a park, but no tennis court. The next spot on the list had a tennis court, but seemed to be a junior high school. The sign said Public Park, so we went on in. A few minutes later, the bell rang and out came all the kids for gym class. We kept playing tennis, but then the coach came over and told us to move on. Yes, we were the two creepy guys hanging out at the junior high in the middle of a school day. Las Vegas recently decided that instead of just blowing up all of its old landmarks, it should try to hang on to at least a little bit of history. They are building a Neon Lights museum with old signs from old casinos. In the meantime, they host tours of the "boneyard," a dirt lot full of huge, beat up neon signs. It also has the charm of millions of broken bottles and broken light bulbs everywhere. It was awesome. The boneyard also had the 30-foot tall leprechaun from the O'Shea's casino. Unlike many of the signs, it was in great shape when it showed up. However, now it was all charred up. Apparently, a bum had been living inside of it and it had caught on fire when he started a fire inside of it. When a restaurant boasts something like that, it must be true. The Lotus of Siam is strip mall full of Asian restaurants and billiards halls and may or may not have actually been the best Thai restaurant in North America, but there was a picture of Pat Sajack on the wall, so it probably was. For their encore, BR came out with three acoustic guitars and a stare drum. "I bet you didn't know that we influenced bands like The Eagles and Crosby Stills and Nash," Greg Graffin quipped. They played "Dearly Beloved" from their new record. It was really very good, but it was cool to see, nevertheless. Though I don't like their new album, BR always puts on a good live show. When I saw Strung Out in Vegas six years ago, lead singer Jason Cruz flipped me off. Me personally. Why? I'm still not sure. I haven't been flipped off many times in my life and up until that point I had never been flipped off by a rock star. There's a first time for everything, I guess. Day two at Kindergarten: Taught kids about cash money. I held up big pictures of a penny, nickel, dime and quarter. Loved by all. However, the biggest highlight came before I started the lesson. Today was the first day back from spring break, so I asked the kids if they had a fun week. One kid raised his hand and said excitedly, “My dad hit a pigeon with an Easter egg!” Sweet. I took Paige to her first concert tonight. (My parents wouldn't let me go to concerts until I was 14.) We went to Kilby Court to see my friend Brian's band Atherton play. She absolutely loved it. She sat on my shoulders the whole show, just bobbing up and down and tapping the rhythm on my head. When we got back in the car she immediately said, "Andre?" Though Paige likes the rock and roll, her heart really belongs to Andre Rieu. Paige can't not dance to this song. Last night she was dancing to it and ran right into the wall. I taught kindergarten yesterday. My work sponsors a Title I (low income) elementary school in West Valley. Last year, my buddy Tim would go over there once a week and help tutor kids in reading and stuff. That seemed like a good enough thing to do. So when the volunteer sign up sheet came around this year, I figured I’d help out. It wasn’t until after I had already enrolled that I found out that I wasn’t going to be a tutor, but I was to actually teach kindergarten for a half hour each week for five weeks. I am teaching Junior Achievement lessons. The older grades learn about grown-up jobs and how that makes the economy work, etc. Because I don’t know how any of that stuff works, I am teaching the kindergartners. I read them a story about Robbie and Martin working on their uncle’s farm. They went into town to trade their eggs for some bread. Wow. The 30 minutes went just fine. I went in and introduced myself, “Hi. My name is Spencer and I’m going to teach you about work.” I had written each of the kid’s names on a table tent. I took them out of the bag and said, “When I say your name, raise your hand and I’ll give you your nametag.” I pulled out my own nametag and said, “Spencer?” The teacher responded quickly, “You must have the wrong class.” “Uh, no,” I said. “I’m Spencer.” And from there, things went swimmingly. Millencolin's new record is coming out in May. Judging from this video and the other new track on their Myspace page, the Swedes are putting out their poppiest material to date. Though it's a bit different, I feel better about this direction shift than I did when they tried to be a hard rock band circa Home From Home. The point of all of this is that the last time I saw Dr. Lee was when my ear almost blew up. When I thought I was going to be deaf I was pretty bummed out. And when I was driving home from the doctor I was wishing I could just cut out my throat all together. Comparing the two maladies, I would prefer to be mute rather than deaf. I could learn sign language and so could Traci. I could type emails and maybe have one of those Shephen Hawking voice robot computers. No sweat. But no hearing, that's a drag. How would I hear when Paige finds something she's lost and exclaims, "There it are!" Yep, I'd definitely rather lose a throat and keep my ears. So we had our show with the Voodoo Glow Skulls and it went pretty good. When we arrived, I saw that VGS was already sitting on the couches in the back of the bar. I went over and introduced myself to Frank and thanked him for letting me do the interview. Thought it was a bit lame, I handed him a copy of the magazine and said, "In case you wanted to know what you said to me." I was happy to see that after I walked away he was reading the article and I saw it get passed around amongst the band. My band played decent. It's amazing how many hundreds of times you can play a song great in your basement and screw it up the second you play in front of a live audience. But that's to be expected and not really that big of a deal. There were probably 40 people in the room while we played, most of whom were attentive. So we can't complain about that at all. The other local band, The Willkills was both really nice and quite cool. And the other touring group, Knockout, did the best cover of a Bad Religion song I've ever heard--a reggae-to-punk version of "Generator." After 20 years, Voodoo Glow Skulls has still got it. The performance was just as intense as when I saw them nine years ago. When 6'2" 220 lbs. Frank came on stage wearing a Mexican wrestling mask and started shouting their first song, I knew they were going to bring it. And bring it they did. It got both brung and broughten. To the max. I don't spend a whole lot of time blogging about my tender little feelings. However, over the weekend I did wax emotional a bit. Traci and I spent Friday and Saturday with our friends Bert and Karin and their two daughters at Bert's family cabin. Bert has been my friend since we were two years old, thus occupying the role of my oldest still-friend by about 15 years. Every six months or so my mom makes a random comment like "Do you and Bert feel old enough to be having kids?" Or "Now, when you were 10 did you picture this would be how you and Bert's life would be?" I think that's just her way of dealing with the idea that her baby is old enough to have his own baby. But as I was outside playing with Bert and our two, two-year-old girls I thought about how this was the same age when Bert and I would have first started playing together. It was also interesting to look at our little girls, both of whom look just like us. I tried to get a picture of the two of them together but Paige, who was being a little monster all weekend long kept crying and saying "See ya later, picture" (translation: no pictures). They did manage to have some fun together, though. They both loved getting licked by Bert's new dog and getting pulled around in the sleds. Paige couldn't quite pronounce Mackenzie, or even Kenzie, so she called her "Candies." I thought that was quite a compliment, as "candy" is by far Paige's favorite thing in the world. In 1996, Ty and I chose to pass up an Attaboy Skip show to see the Voodoo Glow Skulls play at Bricks. We'd never heard VGS before, but the artwork on their album Firme was so awesome that we knew that we'd love them. Goldfinger was the touring support, so it surprised us when VGS came on second. They played four songs, which took about 10 minutes and then walked off the stage. We vowed to never support them again. But the draw to Firme was just too strong. We bought a copy at Media Play and we've been fans ever since. Since the inception of Johnny Tightlips, I think I have tried to get the band on as the opening act for Voodoo Glow Skulls at least five times. Each time the promoter strings us along and then doesn't tell us that we're not playing the show. This time it's finally going to happen (fingers crossed). So in just a few days the band is going to have our biggest show to date. Not big in terms of number of people--I'm sure there will be very few people in the crowd when we start playing-- but big in that we're going to be on the same stage as one of my favorite bands. I am completely nervous, and like every show, I'm totally wishing that we never would have sought it out. That anxiety will intensify until we go on stage. I'll be nervous while we play and then immediately after, I will be so excited/relieved that the only thing I'll be able to think about is playing another show. For the past few months I've been writing album reviews for In Utah This Week. I figured it afforded me an opportunity that I never would have had otherwise. With being assigned, or even clearing it with my editor, I sent an email to VGS, requesting an interview for the magazine. I was excited when I heard back from lead singer Frank Casillas. We set up a time and I gave him a call a few days later. I was nervous to talk to him--especially two minutes into the interview when my digital recorded started beeping because it was out of memory--but he was incredibly cool and very easy to talk to. At the show on Thursday I plan to meet him in person, which I'm really looking forward to. Fifteen years of genre-bending have the Voodoo Glow Skulls radiating worldwide. Mixing ska, metal and Latin, the genre-defying Voodoo Glow Skulls have sold more than 1 million records since their debut 15 years ago. With their seventh album, “California Street Music,” the band shows no signs of slowing down. In Utah This Week caught up with frontman Frank Casillas before the band headed out its current West Coast tour. IN: Over your career, you’ve outlasted almost all of your peers. What’s been the key to the success and longevity of your band? Frank Casillas: We decided a long time ago that we were going to be a punk rock band. There’s a lot of work ethic and DIY values that we started out with back in the day that got us where we’re at now. We’ve always tried to maintain that type of integrity. There was a point in time where we were persuaded to have corporate and business management, but at the end of the day all they were doing was sucking money out of the band. We eliminated all of that from the business part of the band and took it upon ourselves to do everything on our own. [Fortunately], we weren’t thrown through the system. That seems to be a common thing with commercial labels — they get a band sopping wet and they throw them against the wall to see if they’ll stick. Nine times out of 10 they don’t. That’s why you don’t hear about [a lot of bands] again after their debut. We’ve always been aware of that. We’ve always called our own shots and done what we thought was best. We’re still doing it. The phone’s still ringing and we’re still here. IN: You took a longer time to put out “California Street Music” than usual. How do you think that affected the process and the final product? FC: Throughout the years, we’ve been developing our own recording studio. We’ve done the last couple of records on our own. This time we just decided to wait until it felt right. Nobody was really saying ‘Man, you’ve got to put this record out right now.’ There were really no deadlines. We wanted to take our time with it. We wanted to reinvent what we had done on the first couple of albums. We tried to re-create what the Voodoo Glow Skulls are known for — the manic sound. A mixture of punk, metal, ska and Latin, and little bit of hip-hop. We tried to re-create what we’re known for and come out with a young-sounding album again. We didn’t really try to go for any goals or anything; we just put ourselves in the studio. It took us a couple of years because we were on tour while we were trying to write the album. A lot of it was writing songs, putting them on hold for a couple months, coming back and giving them another listen, reevaluating what we did a couple months before, and fixing it — basically just taking our time. We came out with a good record. It’s not the best we can do, by all means, but it was a good transition and probably what people were expecting from us at this time. 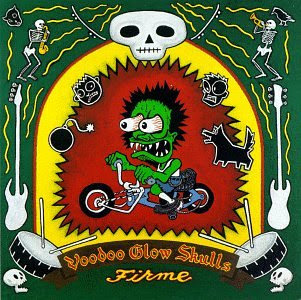 IN: If someone were checking out Voodoo Glow Skulls for the first time, what record would you recommend? FC: The record that got us the most notoriety was “Firme.” That record catapulted the band to the next level. I think it’s the record a lot of people identify the band with. “Band Geek Mafia” is also a fan favorite. Those two are the ones that made the biggest impact on our fans. IN: Voodoo Glow Skulls have played everywhere. Where are your best international fans? FC: Mexico is always great for us. My parents are from Mexico and we’ve got family there. Plus we did the “Firme” record all in Spanish, which got us a lot of attention there. That’s where we have the most rabid fans, where fans really go nuts over the band. On our last tour, we made it to some Eastern European countries [including Croatia and Slovenia] for the first time. The crowds were so happy just to have an American band in their presence. It could have been anybody probably [laughs], but for Voodoo Glow Skulls to go somewhere where many American bands never get to go ... it was a great feeling. It’s a sense of accomplishment when you can say, ‘Our music is the reason why we’re here. And our music got us here.’ There are a lot of places abroad where they take in the band, and where we’re well respected. Japan has some of the best audiences. The UK is also a great for this type of music. We don’t break attendance records everywhere we go. We play small, comfortable clubs — places where fans can see the band and experience the band the way they want to. We do play big festivals as well. Every gig is different. For us, it’s great just to be able to maintain and do what we do — play small punk rock shows for the most part. And sometimes you’ll travel across the globe and play a small, 200- person venue. And some of those are the best shows.